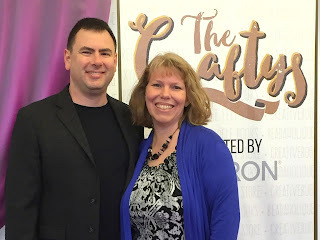 On Friday, I had the honor of attending The Craftys award ceremony in San Francisco. 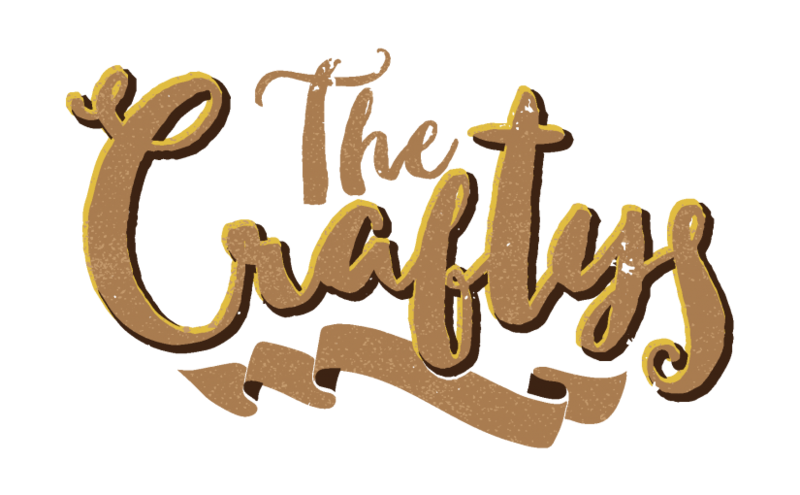 The Craftys began in 2014 to celebrate the best in crafting and DIY across the United States. The debut was a huge success. There were over a thousand entries culminating in Stephanie Klose taking the grand prize for her stunning knitted wedding dress. Fifteen professionals in the craft industry served as judges. They had the difficult job of paring down the large number of nominees into ten finalists per category. 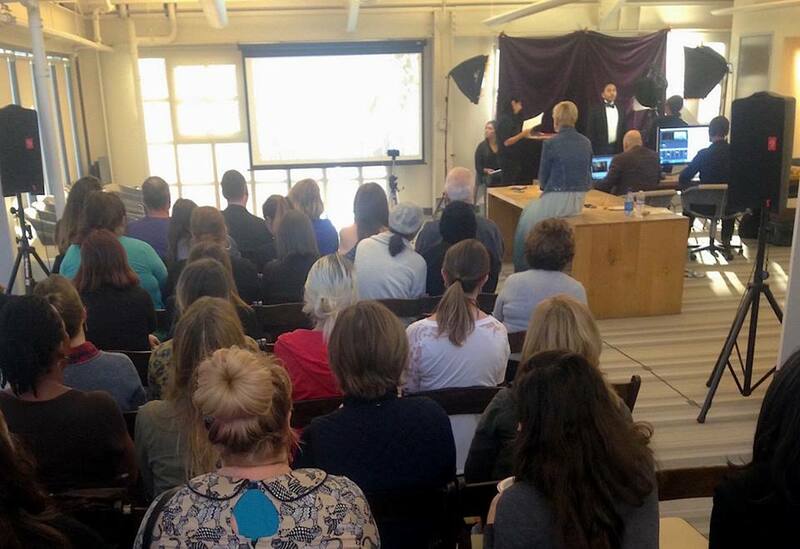 The winners were announced via a live webcast hosted by the fabulous Mark Montano. But before I get to that, how about some looks behind-the-scenes? I was able to bring a +1 to the event, so Steve joined me. The event was held at the beautiful headquarters of Chronicle Books on 2nd Street in San Francisco. When we arrived, we were escorted up to the fourth floor for pre-show mingling, photos, and a wonderful spread of food and drink. With cocktail in hand, I took some time to explore the areas beyond the reception room. The building has an industrial feel with eye-catching book cover art on display. Down each hallway, Chronicle's latest books are displayed. I thumbed through quite a few of them in the short time I had, though I could have happily spent all day reading! There were delightful touches of whimsy throughout. The bright tape on the floor and wall spelling BOOKS only reads correctly from a sofa in the center of the room. I *might* have leaned over some seated strangers to take this photo. Here's the view from the back of the room. You can see me in the blue, front and center, with Steve in black on my left. Mark Montano did an excellent job as host. It was great fun watching him. I've had the pleasure of meeting him in person a handful of times after first watching him on TLC's While You Were Out. He's as charming and well-spoken off camera as he is on camera. Beth Kingston was Mark's co-host. What a pleasure to meet her! She is awesome. I was very impressed with the finalists' projects. There certainly is a lot of talent out there! I'm glad that The Craftys is bringing recognition to those amazing artists, crafters and bloggers. Speaking of bloggers, I was most interested in seeing who would win The Craftys Best Craft Blogger. 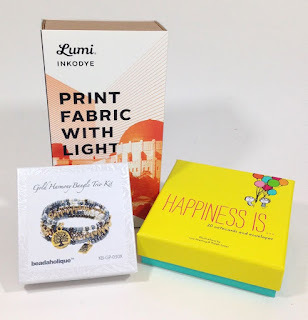 I had the pleasure of working with one of the nominees, Amy Latta of One Artsy Mama, back in 2013. She does a lot of kids' crafts and is a frequent contributor to Fun Family Crafts. I was thrilled for Amy when Mark announced her name as the winner! As part of her prize, she'll be doing a book proposal for Chronicle Books. Amy has agreed to do an interview with me, so I'll be sharing that later this week. Thanks Amy and huge congratulations! I loved the trophies the winners received. This one, for Best Online Store, was in the reception area for us to photograph. The very talented Brenda Dee Cook of Lemon Tree Workshop is the artist behind these awesome trophies. After the broadcast ended, we were invited back to the reception area for more mingling, photos, food and drink. Steve tried to get a photo of just Mark and me, but I insisted he jump in the photo too. All too soon, it was time to go. 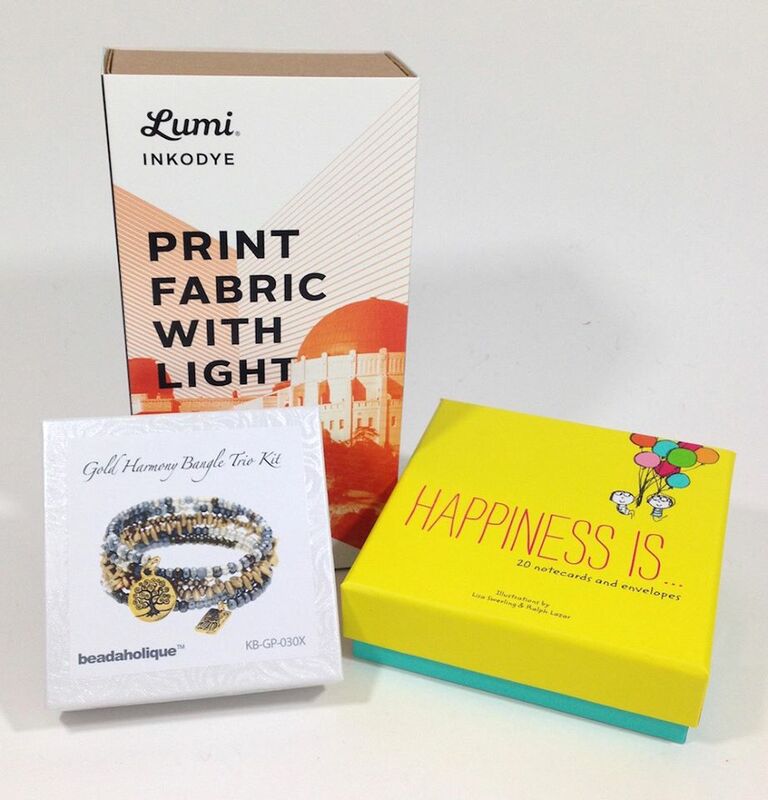 On our way out, we each got swag bags with a bracelet kit from Beadaholique, a printing kit from Lumi Inkodye, and greeting cards from Chronicle Books. Fun! We had a wonderful time attending The 2015 Craftys! Congratulations to all the finalists and winners. Thank you to all the sponsors and organizers for all your hard work. What a joy to see outstanding artists and crafters receiving the recognition they deserve! Thank you so much!! I'm so incredibly excited! I watched the whole video. Amazing projects! Loved the crane dress and the fact that she sometimes judges how much time she has left to work on something by episodes of tv watched instead of hours. The presentation of the crafts was very creative BUT also a bit annoying with all the bouncing around as I wanted to read the titles and not have to pause to do it. Love your blog Cindy and now being retired I can actually find time to read it! I agree- not a fan of the bouncing. That sounds like it was a great time! I plan on going back and watching the video, soon. Mark Montano seems like a fun guy to be around. He is! Hopefully you'll get to meet him at CHA. He is awesome! I love Mark!!! What a fun event!!!!! LOVING the photos! !